I love being a teacher. I know it is my calling. It can be frustrating when you know what you need to be a successful teacher, but you receive something else. 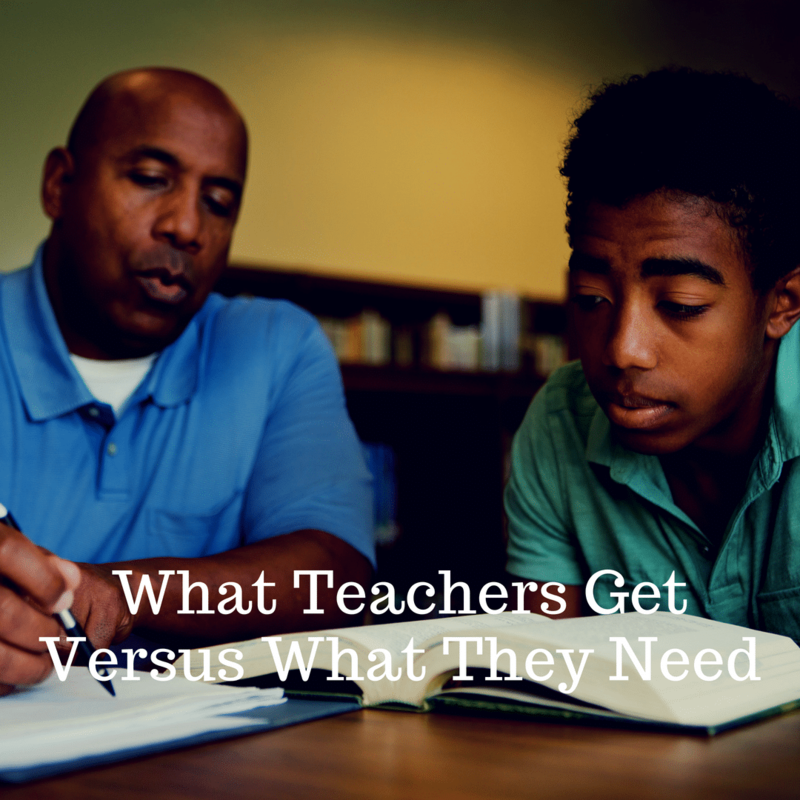 Here are a few things teachers get, versus what they really need. If you are truly a reflective practitioner like they taught us to be in college, then you know your shortcomings. You also know what you need to learn to help engage students in content. Instead of being able to attend a professional development opportunity that you would like to attend, teachers get to attend district or school selected PD. I know, I know, some schools think they are offering us a choice when they give us a menu of professional development to attend. Don’t tell us to think outside of the box when our professional development is boxed into the few options we are given. Apparently, marking up a teacher’s evaluation with needs improvement and a deadline to improve is supposed to magically help the teacher get better. Teachers aren’t inside of the administrator’s head and without specific guidance and support many times teachers work overtime to improve and end up having their contract not be renewed or finding themselves on a plan which is a signal that your time at the school is coming to an end. Apparently, in some training somewhere, administrators learned that teachers enjoy waiting for their name to be called in a raffle to pick from stuff they don’t want or need. Maybe the administrator was given a lot of stuff, but in most cases, I have seen administrators buy stuff for a raffle to boost morale and bring excitement. Also, wearing jeans does not boost morale or giving me another Starbucks card. At this point in my career, I can’t even pretend that I’m excited anymore. If the culture in the school is positive, then you won’t have to come up with ways to boost morale. Beware when your administrator returns from a PD. The next thing you know is everyone has been provided materials based on something new the administrator learned. You have money to buy everyone this resources, but the basic supplies I need to run my class can’t be purchased. I’m still trying to figure out how this works. In one school where I was employed, it was against school policy to eat or drink in the hallway. The principal’s rationale was that it wasn’t fair to tell students not to eat or drink in the hall and we were doing the same. Look, I’m grown and there are some things I get to do that children don’t get to do because I am grown. I understand that jobs have rules, but do we need rules about every little thing? For the last three school years, I have taken on teacher leader roles. The leadership experience was great. But as my husband pointed out, “Why do you have to jump through more hoops to get these special roles to get more money when you could switch to another school and do one job and just get a pay raise?” My husband made a valid point and I took his advice. I did just that this school year. I’m no longer a teacher leader, but I don’t have to do extra work for more money. I went to a district that paid me more, thousands of dollars more. This means more time for myself, my husband, and my boys. I’m sure I missed some. What would you add to this list? Thank you for leading the conversation on truly helping teachers who help students. I, former teacher and administrator, agree with you. Teachers get a lot a things that they don’t really need or want. Administrators try to give things that help teachers cope with the stress rather than things that directly deal with the stress. Paper, copies, positive school culture and climate, decision-making opportunities are all things that affect the day-to-day lives of a teacher. We definitely need to address these things #SoTeachersCanTeach. I am interested in hearing what would be some things that would help you “run” your class and build a positive school culture? What teachers get: requirements to do data analysis and submit reports to administration. What teachers need: time during the school day to accomplish tasks (grading, contacting parents, etc.) that are essential to student achievement. Thanks for your comment Kelsey. A huge problem in education is that we don’t stand up for ourselves, but I think the tide is changing now.